The space will host its final show on April 30. As New York City arts culture shifted from downtown Manhattan to Brooklyn around the turn of the century, a slew of underground music venues began to crop up. Monster Island, Big Snow Buffalo Lodge, and 285 Kent were all vital spaces to the rapidly growing scene, which has now reached a critical point. How do we support and maintain DIY music as the city continues to grow and evolve? In recent years, the answer has proved increasingly difficult. On Tuesday, the Silent Barn, a community arts space that has existed in two different locations since 2006, announced it will close after its final show, set to take place April 30. For many, the news marks the end of an era. 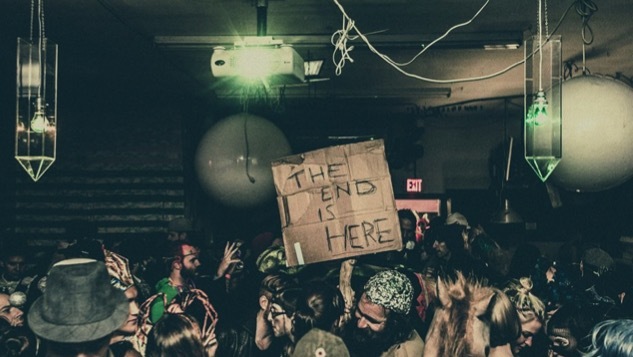 Throughout the past decade, Silent Barn—along with like-minded spaces Death by Audio, which closed in 2014, and Shea Stadium, which hosted its final show last year—has welcomed countless artists and helped launch the careers of some of New York’s best bands. These were intimate, inclusive spaces—the type of venue where the musicians and the fans were one in the same. The old Silent Barn in Ridgewood [Queens] was my first experience with DIY and all ages shows—as a teenager from New York it totally changed my concept of who could be involved in making and experiencing live music. I was a bit older by the time new Silent Barn opened, and that again opened my mind to what a venue could do for its community. Silent Barn fought for inclusivity, education, and affordable artist housing against its neighborhood’s gentrification, also while acknowledging its role in that same process, making a safer scene for more people. I feel very lucky to have played and booked shows in both locations, to have recorded in its studios, and to have experienced so many of the magic events they orchestrated over the years. Crossing my fingers for Silent Barn’s next incarnation, and I hope people keep supporting Educated Little Monsters. Now that New York has elected its first Nightlife Mayor, Ariel Palitz, will spaces like the Silent Barn continue to shutter? Only time will tell. While Brooklyn’s bigger, glossier venues like Baby’s All Right and the newly opened Elsewhere are thriving, the smaller, more intimate spaces are, for the most part, completely gone. Silent Barn, Death By Audio, and Shea Stadium were the kinds of places where everybody knew your name — even if your name wasn’t Kendall Jenner. With all three disappeared, Brooklyn DIY has suffered a crippling blow. Read the Silent Barn’s full statement here.